Before I talk about pot roast, I have to send a shout-out to the CTA. Yes, the CTA. I left my bag on the bus last night. The bag that contained my wallet, my cards, my checkbook, my money, an extra set of keys to my apartment, the book I was reading, and the shawl I have been working on for the past three years. I totally freaked out, as I'm sure you can imagine. I called the CTA as soon as I got home but they said I would have to call back in the morning. I was a wreck, but finally talked myself into going to bed since there was nothing I could do about it, but of course I couldn't sleep. So thank you CTA. Not just for keeping my bag safe for me, but for taking the extra trouble to call me so I would not have to worry a minute longer than necessary. And now for the pot roast. I have created a braising monster, and it is a very good thing. A friend sent me an email asking if I knew what stewing beef was because it was an ingredient in a recipe she was going to make. I wasn't sure, so I thought I would take the question to my new best friend at the Apple Market and see if he could help me figure it out. He thought maybe they were talking about beef shanks (turns out he was right), but one of the other suggestions he made was a beautiful chuck roast, which was so beautiful that of course it came home with me. It was a big piece of meat, too big for any of the pans I usually use, and I have recently realized that my lack of a dutch oven that can be used both on the stovetop and in the oven is a serious lack. The only pan that would work is the roasting pan I had decided I no longer needed and keep in my donation pile. Seeing as how this is the second time I have pulled it out to use since deciding to get rid of it, I am seriously reconsidering that decision. I wasn't sure it would work on the stovetop, but I positioned it over two burners, heated up some oil, and went to work on the vegetables. I decided to sear the meat in the oven instead of in the pan. It was a technique I had just watched on "The Barefoot Contessa" on the Food Network (I'd link but there's an annoying video that loads automatically). You season the meat, then roast it for 15 minutes in a 400 degree oven. It saves some time - you can get the vegetables started while the meat is in the oven, and it doesn't smoke up the kitchen as much. At first I thought the roasting pan wasn't going to work on the stovetop. It is designed for the oven, where the heat flows all around it. There is not much natural conductivity so the parts that were directly over the burner got quite hotter than the rest of the pan. I had to stir constantly, and it took longer than it would have in a Dutch Oven. It did work in the end, though. But I think I will be buying a Dutch Oven before too long. Ina Garten used leeks in her dish, so I decided to use them in mine. I can't say that I particiularly noticed their presence, but the overall effect was a resounding success so I would use them again. The beauty of this and all of the other braises I've done so far is that it doesn't really matter what you put into it. Everything contributes, but nothing else is necessary. Except for the onion and garlic, I guess. I was going to use red wine but I had forgotten that I used up the last of what I had on my pork chops and I had taken my last full bottle to a friend's house. Vegetable broth worked just fine. But I have beef shanks defrosting in the refrigerator and a nice bottle of Marco Real Tempranillo sitting on the shelf, so I will be reporting on that soon. Let chuck roast come to room temperature. Season well with salt and pepper and roast in the 400 deg. oven for 15 minutes. Take it out of the oven and cover loosely with foil while the vegetables are being prepared. Turn the oven down to 300 deg. F.
While the meat is roasting, heat oil in dutch oven or roasting pan that can be used on the stove and in the oven. 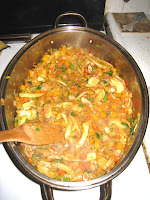 Add onions, carrots, celery, leek, and fennel and cook, stirring frequently, until onions and celery are translucent. Add garlic and cook for another minute. Add paprika and cook for an additional minute. Add tomato paste and cook for another minute. Season with salt and pepper to taste. Add the meat to the pan, nestling it into the vegetables. Add vegetable broth and enough water if necessary to cover the meat about two-thirds of the way. Add thyme and brown sugar and stir it into the broth. Cover the pan and place it in the oven. Cook for two to three hours in 300 deg. oven, checking after two hours to see if the meat is tender. The meat is done when you can shred it between two forks. Remove the meat from the pan. 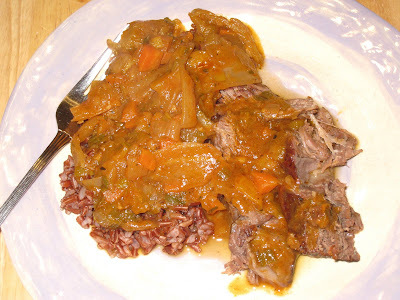 If the sauce is thin, simmer it over medium heat until it reaches the desired consistency. Yay! Nothing like a happy ending. Who would have thought the CTA would be so humane? The pot roast looks wonderful. (By the way, my verification code is "pangy." Which sound like something + tangy). Yes, I was quite surprised and most grateful. It does look good, doesn't it? And it tasted wonderful too.